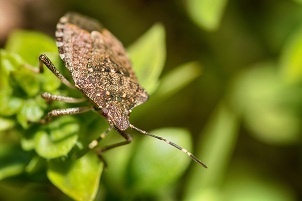 Stink bugs are unwanted visitors in your home because not only are the insect invaders, but they also smell terrible! They're named after the foul odor they emit from glands in their abdomen. Most scientists believe that this is to protect themselves from predators. Their unwelcome smell makes eradicating their presence in your house a bit more difficult. Many homeowners will chose to vacuum up the little buddies in an effort to avoid the terrible smell. They find, however, that the smell still tends to linger inside the vacuum itself. You should call pest control in Middletown, NY, to help you with your infestation, but to prevent problems like this in the future read on to discover tips and tricks on how to keep the bad bugs out! At any time give Garrie Pest Control at (800) 339-0351! You should use caulk to seal up any cracks or crevices in your home that a bug could crawl through. Stink bugs like to make themselves cozy and warm inside your home as it starts to get cooler outside. Typically they gain access through windows and vents, so be mindful of those areas of your house in particular. During the late summer and early fall, these bugs shelter themselves and stay hidden throughout the frigid winter. You won’t see them during this time, but you’ll certainly notice them on their way out! As they try to make their way back outside, stink bugs accidentally proceed further into your home. If you have any broken or torn screens on your windows and doors repair them immediately! Stink bugs look at those rips and tears and take that as an open invitation to stay in your home as long as they wish! A pest control company in Middletown, NY, can help shoo the little guys away once they’re inside your home, but you can keep stink bugs from even seeing your home as a lodging option!